Matthew Apgar - mapgar@shawmedia.com Pam Lencioni of Huntley stretches out in a core plank maneuver with classmates during a body sculpt class on Tuesday, Jan. 19, 2016 at the Huntley Parks District building in Huntley. Matthew Apgar - mapgar@shawmedia.com Fitness instructor Lana Kalinowski of Huntley leads the body sculpt class in exercises on Tuesday, Jan. 19, 2016 at the Huntley Parks District building in Huntley. 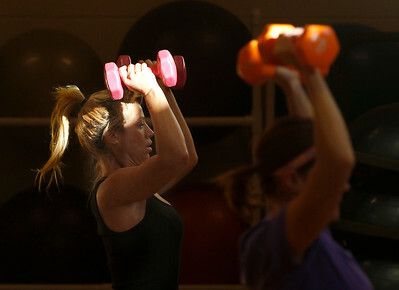 Matthew Apgar - mapgar@shawmedia.com Summer Bakley, left, and Erica Helzer, both of Huntley, workout with their dumbbells during a body sculpt class on Tuesday, Jan. 19, 2016 at the Huntley Parks District building in Huntley. Matthew Apgar - mapgar@shawmedia.com Fitness instructor Lana Kalinowski of Huntley, front, leads the body sculpt class in exercises on Tuesday, Jan. 19, 2016 at the Huntley Parks District building in Huntley. Matthew Apgar - mapgar@shawmedia.com Pam Lencioni exercises with her dumbbells during a body sculpt class on Tuesday, Jan. 19, 2016 at the Huntley Parks District building in Huntley. 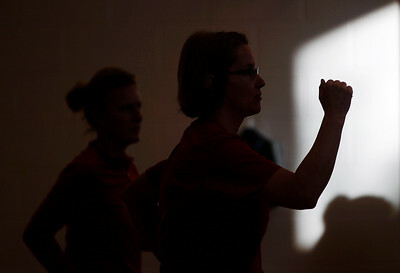 Matthew Apgar - mapgar@shawmedia.com Diana Reincke, front, and Rhonda Pisha, both of Huntley get their exercises during a body sculpt class on Tuesday, Jan. 19, 2016 at the Huntley Parks District building in Huntley. Matthew Apgar - mapgar@shawmedia.com Summer Bakley of Huntley stretches after a body sculpt class on Tuesday, Jan. 19, 2016 at the Huntley Parks District building in Huntley. Matthew Apgar - mapgar@shawmedia.com Summer Bakley of Huntley reaches up with dumbbells during a body sculpt class on Tuesday, Jan. 19, 2016 at the Huntley Parks District building in Huntley. 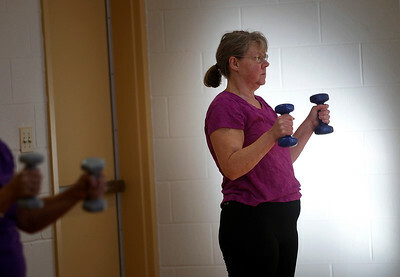 Pam Lencioni exercises with her dumbbells during a body sculpt class on Tuesday, Jan. 19, 2016 at the Huntley Parks District building in Huntley.